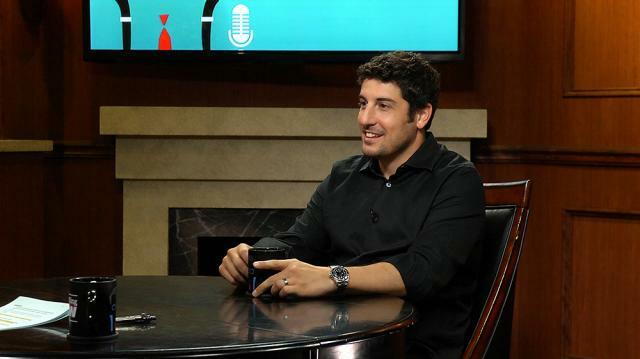 Legendary broadcaster Larry King provides actor Jason Biggs with some sound advice on how to handle fame and public recognition. The ‘American Pie’ star discusses the stress but also the glory associated with celebrity. King: You have called fame stressful in the past, you have anxiety about public recognition, why? one of the most recognizable people in the world, I mean you must get it all the time, and yet what I love aboutyou is that you're at Nate 'n Al's every morning aren't ya. King: Just be yourself. Just, hey,people gonna recognize you. King: You chose to go into a business in which you would be recognized. Biggs: I know you're sayingwhat Sinatra told you and and I'll tell you what Sinatra told me in a minute. King: Sinatra also told me there's a lot of name-dropping. is some, you know, and I don't know, I mean things are probably getting worse because of social media. King: Taking pictures with phones. expectations as well, I think where if you don't sort of meet them, you know, to what their expectations were, they get angry, quick.